I am a rookie at this SDR stuff, using HDSDR software, please someone enlighten me as to how to adjust the FM mode from wide/narrow and or mono/stereo. I cannot listen to any FM stations, All i get is noise in FM mode, waterfall shows strong signal and I have adjusted till I am tired of it. i get no speech or music in fm mode on local stations. It took me a week to get HDSDR to work with all the junk dlls ys have to import. It trashed the drivers for my wireless KB, so i had to revert to a usb KB. Now i wait for the HF-VHF SDR upverter to get here so I can monitor low band freqs with my PC. Ребятушки, друзья подогнали такой вот полосовой фильтр. Нужна Ваша помощь в поиске какой либо информации по нему. Желательно техописание на него. Помогите найти. The impedance of the Radio Station (transmitter or receiver) must be well matched to the antenna`s impedance if we want maximum available power to be delivered to antenna. The return loss and SWR measurements show us the match of the system. Return Loss and SWR both display the match of the system, but they show it in different ways. The return loss displays the ratio of reflected power to reference power in dB. The return loss view is usually preferred over the SWR linear scale, because is easier to compare a small and large number on a logarithmic scale. For radio amateur usage, Return loss more than 14 dB is acceptable. This is adequate to SWR of 1.5 which means that 4% of the power is returned and 96% of the power is transmitted. 0 dB Return loss represent an open or a short antenna terminal, while 45 or more dB Return loss would be close to a perfect match. Many different methods can be used to measure standing wave ratio. Professionals usually use a vector network analyzer or frequency analyzer with sweep signal generator and directional coupler. 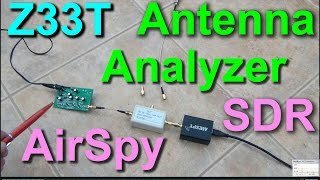 In this video I will show you very cheap and very good method for antenna characterizing which means measuring the Return loss versus frequency and usable antenna bandwidth like measuring with much, much more expensive, state of the art Network Analyzers and similar measuring equipment. 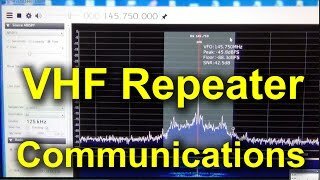 VHF FM Repeater Communications in Macedonia. 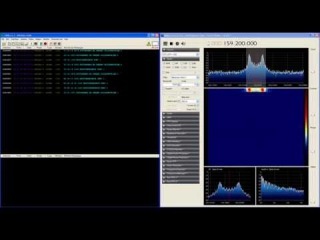 Receiving with Airspy SDR on SDR# software and home made Vertical J-pole antenna. rotating armature radio transmitter in the world and is classified as a World Heritage Site. The transmitter was built in 1922 to 1924 to operate at 17.2 kHz. The antenna is a 1.9 km wire aerial consisting of eight horizontal wires suspended on six 127-metre high freestanding steel pylons in a line, that function as a capacitive top-load to feed energy to six grounded vertical wire radiating elements. Until the 1950s, the Grimeton VLF transmitter was used for transatlantic radio telegraphy to Radio Central in Long Island, New York, USA. From the 1960s until 1996 it transmitted orders to submarines in the Swedish Navy. The Alexanderson transmitter became obsolete in 1996 and went out of service. However, because it was still in good condition it was declared a national monument and can be visited during the summer. On July 2, 2004, the Grimeton VLF transmitter was declared a World Cultural Heritage site by UNESCO. It continues to be used on special occasions such as Alexanderson Day to transmit Morse messages on 17.2 kHz. Its call sign is SAQ. Recent transmissions from SAQ on 17.2 kHz with Alexaderson 200 kW alternator, was on Alexanderson day (Sunday, July 3rd 2016) at 09:00 UTC. Distance between SAQ transmitter in Grimeton, Sweeden and Macedonia where the signal was received is about 1850 km. 1. 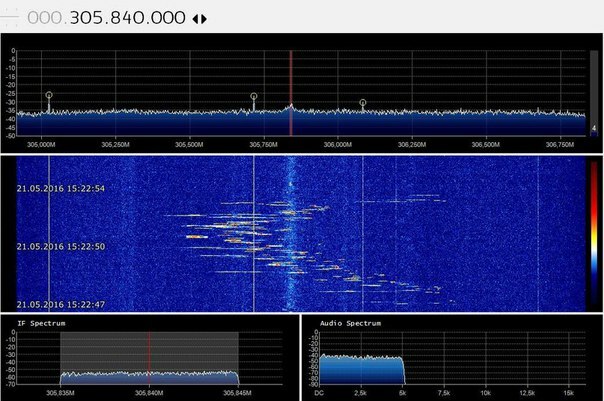 AIRSPY R2 - SDR + Spyverter and SDRsharp software. 2. 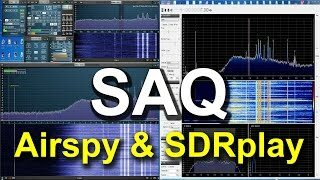 SDRplay RSP1 and SDRuno software. 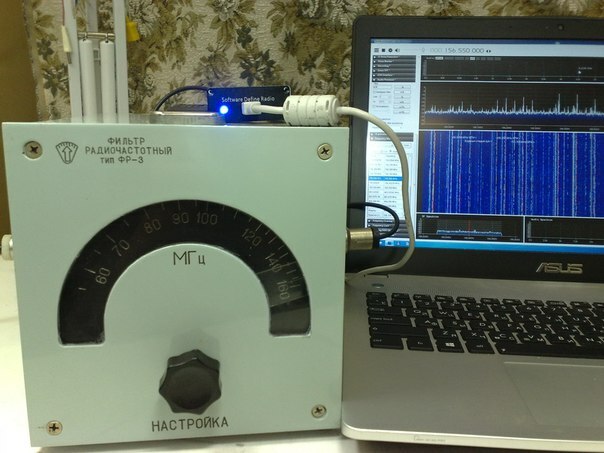 Both SDR receivers settings were previously set for maximum S/N ratio. Antenna is Mini-Whip 10cm homemade active antenna on 6.5 meter plastic pole. The homemade LPF filter (fc=535 kHz) is used also.